In ancient Mesopotamian religion, Lugal-irra and Meslamta-ea are a set of identical twin gods who were worshipped in the village of Kisiga, located in northern Babylonia. They are identified with the constellation Gemini, which is named after them. Identical twins are natural clones of each other. The word prompt this month is … CLONE. The Clonemasters and the Auronar utilised cloning, it was even mentioned in everyone’s favourite episode, Animals. Who will you clone? Two choices. Neither is good. Our character/s must choose one. They have three minutes. Somehow, Avon felt relieved. He wasn’t exactly looking forward to meeting Blake again, anyway. And find Anna there working for the Shadows? I knew you would get the reference! A very tricky trap, Hugbot! LOL! It was the first time he’d underestimated Vila. Of course he would have preferred not to have had to take anyone with him. It was regrettable that the alarm raised by Orac hadn’t come five minutes earlier...the damage to his knee might have been prevented and he could have risked escaping on his own. As it was, he knew he would stand a better chance if he was accompanied by someone who could look out for him. There were, in the event, only two choices. Dayna was dead, Tarrant dying. That left Vila or Soolin. Which one to save? He had only minutes to decide before someone discovered the body of the guard he’d strangled and the chance of escape was gone. It wasn’t an easy choice. Both would undoubtably be annoyed, to put it mildly, about the Gauda Prime debacle and there was strong possibility they might wish to take out their displeasure on his rather damaged body. Vila certainly had no cause to love him but Avon was sure he could cow him into backing down, however angry he might be - Soolin was an altogether more formidable opponent. But then Vila’s skills as a thief were outweighed by Soolin’s prowess with a gun. Orac was the deciding factor. While neither had much time for Ensor’s creation, Vila was the more likely to be persuaded that it was in his best interest to keep Avon alive until they could retrieve it -if only for its salvage value. And once Vila had got him to Its hiding place, Avon could kill him without much trouble. Not something he was likely to achieve if Soolin was his companion. Yes all the odds favoured rescuing Vila. It was, he realised later, the first time he had underestimated the thief. And it also proved to be the last. Anniew...crumbs, very short, very neat, very good!!! And Lurena provided the piccie! “Do you think that this is a good idea?” Soolin asked a concerned Avon. Soolin looked at him; his hand hovering over the communications consol. “I never asked you if you had managed to find that elusive ex mercenary,” Avon asked casually. Avon avoided her accusing eyes. “As much as you trust me,” Avon smiled back. Dayna entered the crew lounge, very excited and babbling about something fantastic created by Vila in honour of the gentlemen that were about to arrive for Avon’s summit meeting. In the food preparation area, Vila was standing back eyeing his latest creation; a pyramid of small gold covered round objects. “What is it?” Soolin asked. “Well we can see that,” Avon said. “NO!! 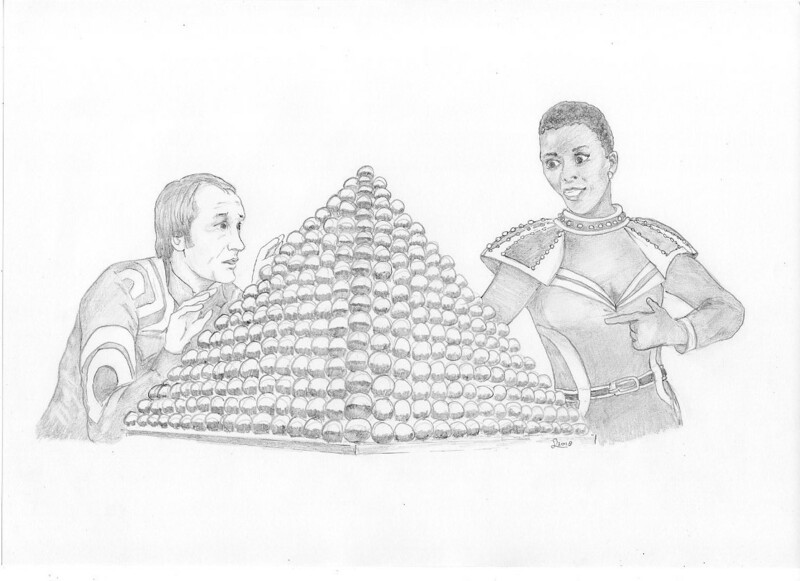 !” Vila yelled, but too late, Dayna had removed the offending sweet from the middle row of the pyramid…and the other sweets cascaded to the floor. Later, on the surface of Xenon, Soolin waited with Avon for the first of the Warlords to land. And so The Revels Saga, latterly Soolin’s Adventures, goes onward to the bitter end that was ‘Blake’…except this story takes a slight detour after that ending of the TV Series. The saga has a happy ending…well as happy an ending as you can get in the B7 Universe! So, look out for ‘The Revels Saga: The Finale’, coming to a Forum Monthly Prompt near you……………….. Wonderful stories so far, with more adventures of Soolin (yay! ), a short but extremely funny story from Hugbot, and dark Vila from Annie. I like dark Vila stories. He had moments to make his choice. There was no way he could carry them both up the ladder at the same time. He decided on the pilot. “I’ll be back”, he promised her. The second wave of explosions ripped through the underground base. She cried out in agony. She didn’t die. But they left her for dead. To be precise, one man left her for dead. He looked at her burnt and charred body. “Help me”, she said faintly, through the smoldering wreckage of the base. He picked up Orac and left. She could swear that she saw him smile as he departed. It took her a year to finally get off that hell-hole of a planet. As a telepath, she found the isolation tortuous. Alone!, she often screamed inside her head. But there was no-one there. She was a vegetarian, but even she had struggled to survive on just nuts and berries. But hatred kept her alive. The plan was intricate. The Blake clone was perfect. It wasn’t the usual type of clone, and it didn’t consider all life was precious. And it didn’t even realise it was a clone – it thought it was the real Blake. And they hit the floor one-by-one, including Vila, who had chosen to save someone else rather than her from those terrible explosions. She still had the third-degree burns. And then only Avon was left. The man who had left her for dead. He raised his gun when he saw her remove her helmet, to reveal her dreadfully scarred face. But at her telepathic command, her men - also disguised as Federation guards - shot him down. None of them were dead, except her Blake clone. She had stunned them, rather than killed them. She knew what unbearable pain and agony was like. By the time that she had finished with them, so would Avon and Vila. Very dark, TT, and very Blake's 7. Annie and TT - you have brilliantly destroyed all the excuses I made for Avon & co when they turned to the dark side. Vivid stories getting right inside their minds. Littlesue - as a newcomer to your Revels saga all I can say is your story really gave me a Boost! LittleSue, with these chocolate stories you are spoiling us! There are only a few more stories to go....The Finale: Episode I, has just 'popped' over to Lurena today. This little Saga started way back in 2016 when PurpleCleric suggested the word Choice...and it's grown from there. I'm currently collating all the stories and hoping to put them together as one long PDF and put it up on my 'bookshelf'. PC asked...Who would you clone? Commissioner Sleer surveyed the scenery from her veranda and was pleased. The white peacock chair that she reposed in was an added luxury, as was the glass of fine wine she held in her hand. Her attention turned to the man who was suddenly standing beside her. …but her guest was already standing there. “And are you flattered?” she asked. The real Carnell took a seat next to Sleer and the proffered glass of wine. She beckoned to the man in question to approach. “But that’s Tarrant,” Carnell exclaimed. 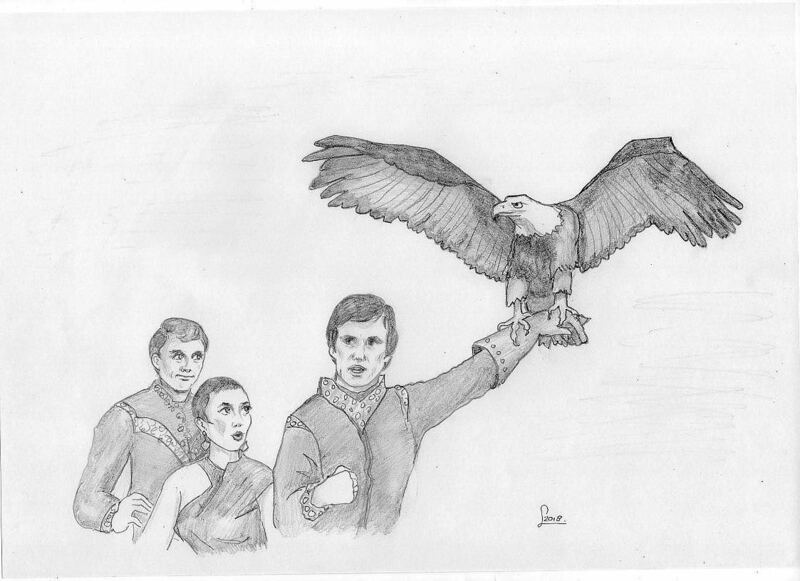 Sleer rang a small bell and seconds later a man appeared; on his outstretched gloved hand a majestic bird of prey. “Blake,” Carnell spluttered into his glass of fine wine. “The bird, sir,” ‘Avon’ explained. On cue, it soared into the sky, then returned at ‘Avon’s’ bidding. “Will you stay for dinner?” Sleer asked. “Yes, Mistress,” both Tarrant and Avon replied, then bowed and left. “How did you ‘get’ Avon?” Carnell asked.